The summer vacation season is upon us! Whether you're just heading to your local park, or a day-long drive to your getaway destination, you want to arrive safely with your bicycles intact. For families, space inside the vehicle can be precious, so you might want to look for ways to carry more gear. Century Cycles carries a full line of Thule bicycle racks for cars, SUVs, and trucks in all three of our stores (Medina, Peninsula, and Rocky River). Thule (pronounce it "TOO-lee") is a company based in Sweden, but all of their bike racks sold in the USA are also made right here in the USA, in one of their factories located in Connecticut or Colorado. You can purchase your bicycle rack worry-free from Century Cycles, because we'll do the research to make sure we pick the right rack that fits your vehicle, we'll assemble it free of charge, and also install it free of charge--all while showing you how to properly install and use it so you can be sure it's safe every time. 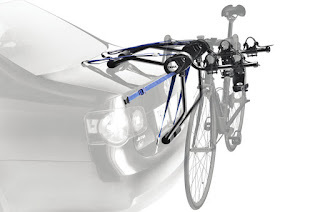 A "trunk rack" is a bicycle carrier that straps to the rear of your vehicle. Most models will work with most cars, SUVs, vans, and some pickup trucks. The entry-level Thule Passage 910XT holds one or two bicycles for only $149.99. A three-bike version (Thule Passage 911XT) is available for $169.99. 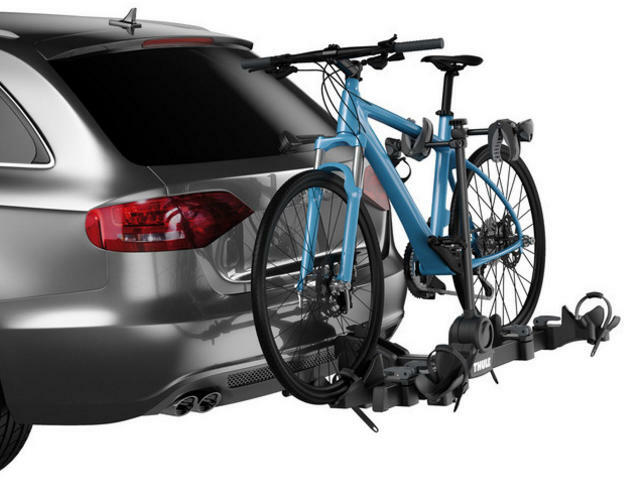 The Thule Raceway Pro trunk racks (available in 2-bike 9001PRO $349.99 or 3-bike 9002PRO $379.99 versions) give you better ease of use and security, with a built-in cable lock and locking steel attachment straps. Got a spare tire on the back of your vehicle? Thule has an answer for that, too! The Thule Spare Me Pro 963PRO ($249.99) holds one or two bikes, and locks securely to your spare tire (if there's a cover over your spare tire, you'll have to remove it). 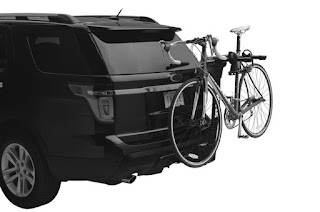 A hitch-mounted bicycle rack attaches to a towing receiver hitch on the rear of your vehicle. If you don't have a receiver hitch, check at your local camper center or towing supply shop (see our Local Resources web page for our suggestions), and they can usually install them on most vehicles for a reasonable price. Hitch receivers come in a width of either 1.25 inches or 2 inches. Some hitch racks work with both sizes, but some are made for a specific size hitch. 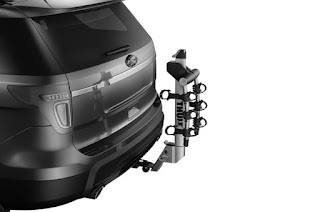 Most hitch racks have a feature that allows the rack to tilt down so you can access your trunk. All of these racks use a threaded hitch pin, so that the rack is held solidly in your vehicle's hitch, without any unwanted wobbling! For added security, you can separately purchase the Thule Snug-Tite Receiver Lock STL2 $59.99 to lock the bike rack to your vehicle's hitch. Step up to the Thule Helium Aero series, and you get a rack with aluminum construction that's nearly half the weight of comparable racks. You also get the Auto-Attach hitch that slides into your 1.25" or 2" receiver and locks in place without any tools. The Thule Doubletrack Pro Hitch Rack 9054 ($349.99) holds two bikes, and features a lower-to-the-ground design that's much easier to load, and works much better with cruiser bikes, ladie's bikes, and other bicycles with non-standard frames. It includes all of the locks and keys needed to secure the rack to your vehicle and the bikes to the rack. Works with both 1.25" and 2" hitches. 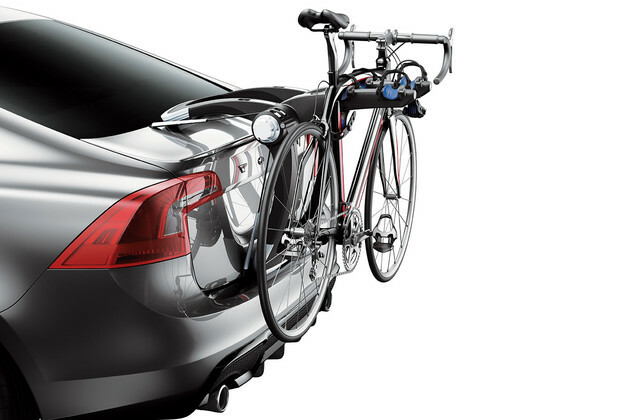 The Thule T2 Pro XT is a top-of-the-line hitch rack for cyclists who want the ultimate in security and ease of use. Out of the box, it holds any bike, with wheels sizes from 20 inches up 29 inches in diameter, including fat bikes with tires up to 5 inches wide! Also features the Auto-Attach system for quick tool-free installation and removal. All of the Thule T2 Pro XT models listed above are Black. They can be special-ordered in Silver (9035XTS/9034XTS/9036XTS). 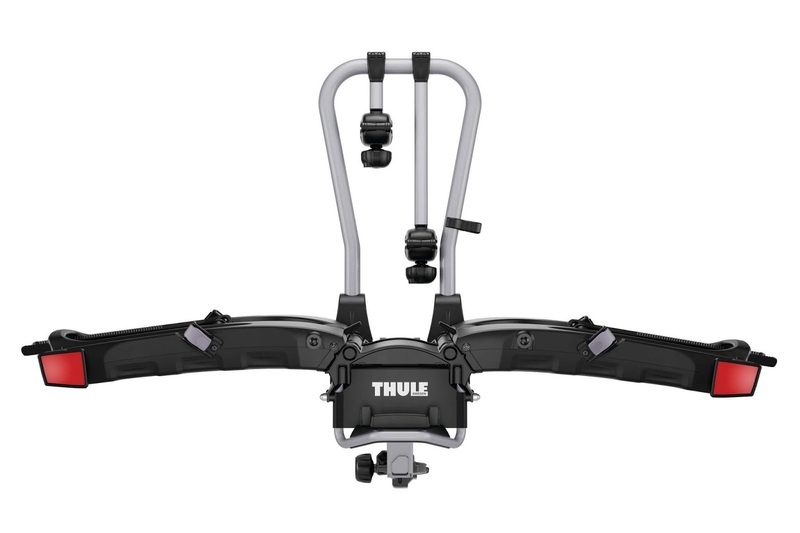 The Thule EasyFold Hitch Rack 9032 ($699.99) delivers solid bike transportation in a convenient, foldable package. The high load capacity (132 pounds) gives the EasyFold plenty of muscle to handle the weight of nearly any bike, including electric bikes. And, there's a removable ramp that makes it easy to load your bikes into position. Cargo boxes provide extra storage space on top of your vehicle to carry luggage, skis, or snowboards. They come in a variety of sizes to fit your needs! Most are in stock in our Medina store, some in Rocky River. Call us for pickup in Peninsula! Thule Force M 624 $519.99 - 13 cubic feet of cargo capacity. 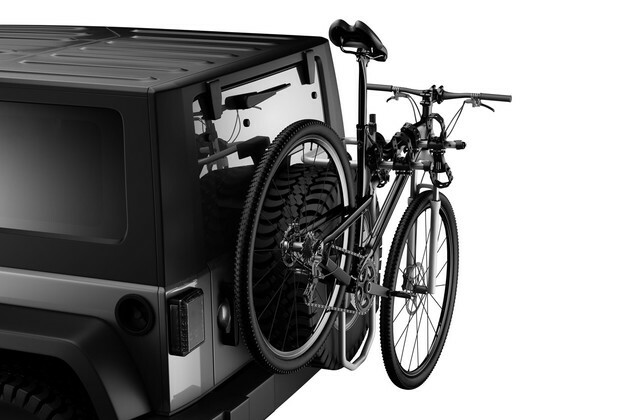 All of Thule's cargo boxes and many of their roof-mounted bicycle carriers can attach directly to a vehicle's factory load bars. If your vehicle does not have factory load bars on the roof, we can outfit you with a Thule roof rack system. In most cases, parts for a roof rack system are special-order, so plan ahead. An installation charge of $60 per hour will apply; most installations take 1 to 2 hours. Some roof-mounted bike carriers require removal of your front wheel, some do not. Some work better with road bikes; others are recommended for mountain bikes. Stop in and talk to us about the various options!